The best in Homestyle Southern Comfort food. Honored by both Southern Living Magazine & Our State Magazine for our country cuisine. We will be closed Wednesday, January 9th for Staff Development. We will be closed Monday, March 4 – Thursday March 7 for scheduled maintenance. For over 50 years, Dan'l Boone Inn has been serving Boone and the high country delicious homecooked meals, just like you remember at grandma's house. Our family style meals begin with a salad in the summer and soup in the winter. Three meats and five vegetables are served along with biscuits, preserves, dessert and beverage. A full family style breakfast is served on Saturdays and Sundays. Dan'l Boone Inn has recently been honored by both Southern Living Magazine and Our State Magazine for our country cuisine. The restaurant placed third in Southern Living in the reader's choice awards for country cooking restaurants. We also won first place among readers of Our State Magazine for Family Dining/Country Cooking and third place under Best Restaurant in North Carolina. If you need information about any of our services, please feel free to use our contact form, send us an e-mail to info@danlbooneinn.com, or give us a call at (828) 264-8657. Cash and Checks Accepted. Sorry, No Credit or Debit Cards. Come & See Us Soon! 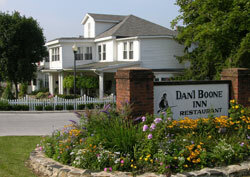 Copyright © 2011-2019 Danl Boone Inn. North Carolina Web Design by AppNet.com.